1. Palestinian tanna of the second century; contemporary of Judah ha-Nasi I. and apparently a pupil of Simeon b. Yoḥai. He is mentioned as having transmitted a halakah of R. Jacob and one of Simeon b. Yoḥai (Tosef., Yad. ii. 9; Shab. 79b); and he had a halakic controversy with Simeon b. Gamaliel and Simeon b. Eleazar, the former being the father and the latter the companion of Judah ha-Nasi (Ber. 25b). Zakkai was prominent in the Haggadah, where he is styled "Zakkai Rabbah" (Zakkai the Great). He interpreted the words "we-yidgu la-rob" (Gen. xlviii. 14) as referring to the haggadic statement that 600,000 children were once thrown into the river by command of Pharaoh, but were saved through the merits of Moses (Gen. R. xcvii. 5; comp. Cant. R. vii. 5; Yalḳ., Isa. 472). Zakkai attained to a very great age, and when his pupils asked him through what virtue he lived so long, he said that he never called his neighbor by a nickname and never neglected to buy wine for the Ḳiddush of the Sabbath. His aged mother even once sold her cap to purchase wine for him, and when she died she left him 300 kegs of wine, while he himself bequeathed to his children 3,000 kegs (Meg. 27b). 2. Babylonian amora of the third century. He emigrated to Palestine, where he was the chief lecturer in R. Johanan's school ('Er. 9a; Yeb. 77b; Sanh. 62a; and elsewhere). In Sanh. 62a and in Yer. Shab. vii. 2, R. Johanan calls him "the Babylonian." The press-house ( ) which he left in Babylon was the meeting-place of certain rabbis ('Er. 49a; B. B. 42b). From Palestine he sent halakah to the exilarch Mar 'Uḳba (Ket. 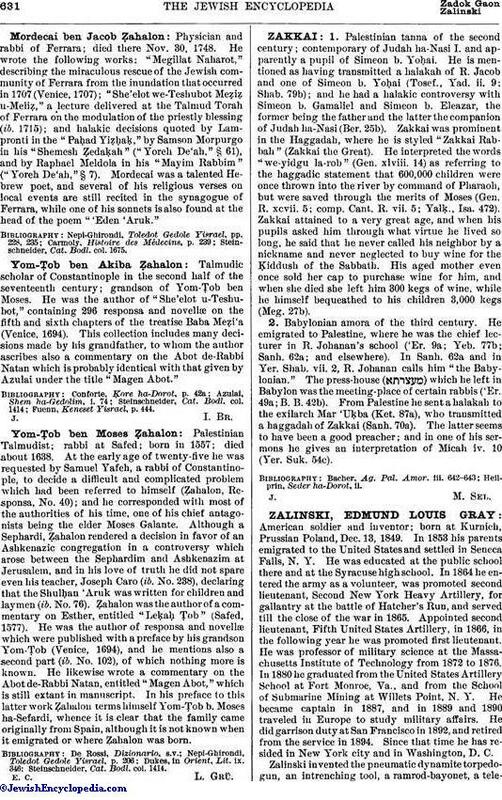 87a), who transmitted a haggadah of Zakkai (Sanh. 70a). The latter seems to have been a good preacher; and in one of his sermons he gives an interpretation of Micah iv. 10 (Yer. Suk. 54c).